Puppy chow is a great treat that the whole family will love! It’s typically already gluten-free and now it can be made dairy-free, too! 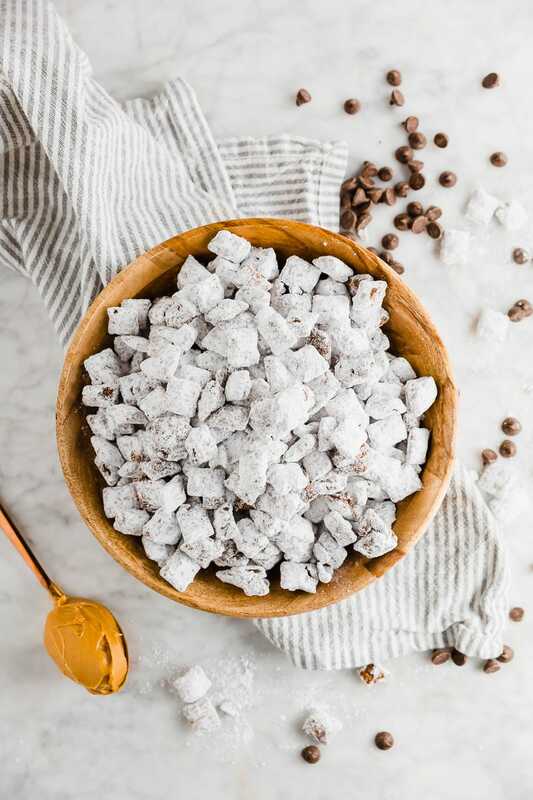 Made with chocolate, peanut butter and powdered sugar, this dairy-free puppy chow is a crowd pleaser perfect for parties! You know it, you love it, you have fond childhood memories of eating it. Am I right? Chocolate, peanut butter, powdered sugar. How could you go wrong? 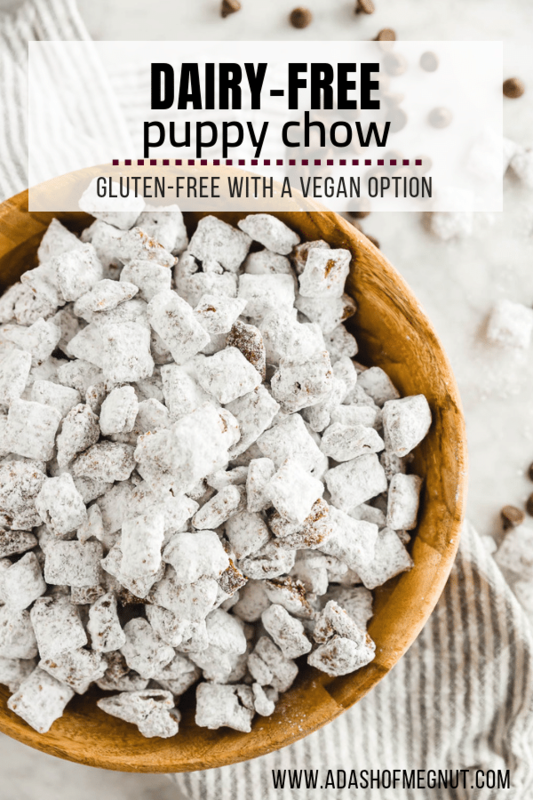 Puppy chow has long been a favorite in my family, but after being diagnosed with celiac disease and learning about my intolerance to dairy I thought it was a treat I wouldn’t be eating in the future. Boy was I wrong! 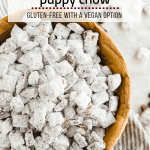 Luckily, puppy chow tends to already be gluten free with the use of rice chex cereal, but I am here to show you that it can be dairy-free, too! 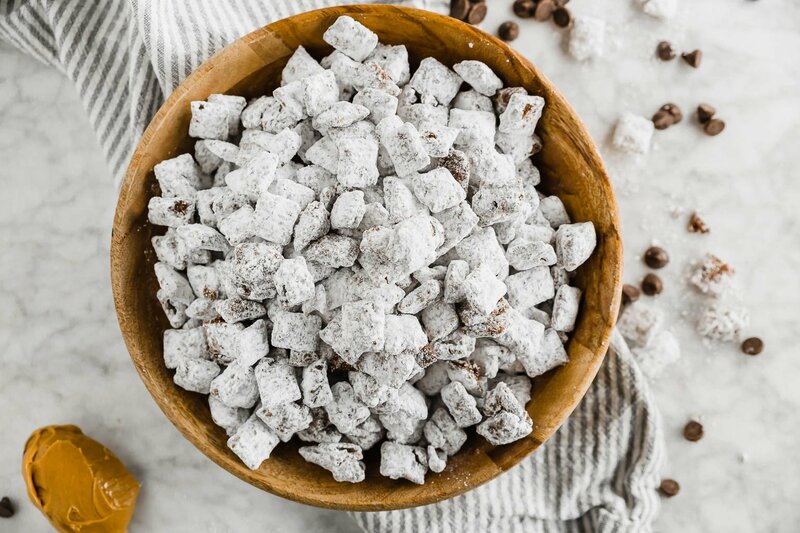 Dairy-free puppy chow does exist and it’s just as good as the original! 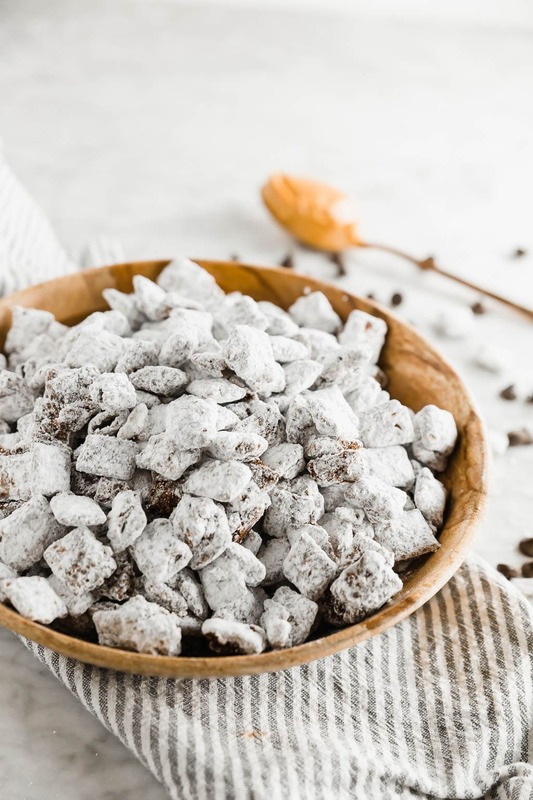 Puppy chow is a tasty snack of rice cereal mixed with melted chocolate, butter, and peanut butter that is covered in powdered sugar. It is a popular party food in the US and can be served as an appetizer, dessert or even a snack! 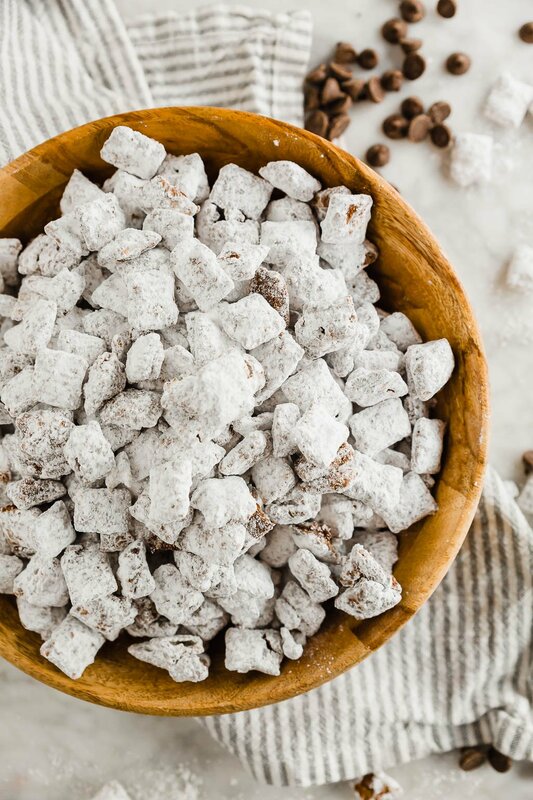 If you aren’t familiar with the term puppy chow but have seen it before, you may know it as muddy buddies, reindeer chow or monkey munch. There are so many weird names for this yummy chocolate peanut butter treat! Is puppy chow for humans? or dogs? Puppy chow is for humans, not dogs. Though I’m sure our canine friends would love to get their paws into this stuff because of the peanut butter, it should NOT be served to dogs at all. Chocolate is extremely bad for dogs so be extra careful when mixing up a bowl of this puppy chow if you have furry friends around. It does tend to be a tad bit messy when stirring so just keep a watchful eye! I know my dog was ready for any stray pieces of peanut butter to drop down. Okay, if it’s not for dogs, then why is it called puppy chow? Puppy chow got it’s name from how it looks well… a bit like dog food! But I swear, it’s a tasty treat! Can I make puppy chow without peanut butter? This is the number one question I get asked about puppy chow. Yes, you can make puppy chow with other nut butters besides peanut butter. If you have a peanut allergy, other nut butters like almond butter and cashew butter work well in this puppy chow recipe. If you are steering clear of all nuts in addition to peanuts, then try Sunbutter, which is made from sunflower seeds! Changing the nut butter in this recipe to a different variety will change the consistency and taste, but the results will still be delicious! Is this puppy chow vegan? Well yes and no. I used Enjoy Life Dark Chocolate Chips and Earth Balance Buttery Spread to make this recipe dairy-free. However, you’ll want to make sure that the chocolate chips that you are using are also vegan. The other consideration to make for vegan puppy chow is to make sure that your sugar is vegan, too. Yes, I said sugar. Most powdered sugars are refined with bone char to get that super white color, making it not vegan. If you’d like to make this puppy chow vegan, use an organic powdered sugar, like Wholesome Organic Powdered Confectioner’s Sugar. First, start by melting your chocolate, non-dairy butter and peanut butter in a microwave safe bowl. Stir the chocolate peanut butter mixture together and pour over the gluten-free rice chex cereal in a large bowl. You’ll want to make sure the bowl is large enough that you can easily mix the cereal and chocolate mixture together without it escaping the bowl. Make sure the cereal gets covered really well. Then, place the chocolate covered cereal in a very large tupperware with a lid (the lid is essential!) or a large gallon-sized Ziploc bag works as well. Cover with powdered sugar and shake, shake, shake until the cereal is completely covered with powdered sugar. Personally, I like to place my puppy chow in the refrigerator for at least an hour so that it gets cold. It taste better that way in my opinion! 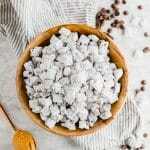 Making your own dairy-free puppy chow at home is very easy. With a few simple swaps, you can make a dairy-free treat that the whole family will love. It’s great for a quick snack or for bringing to parties. Trust me, it will be a crowd favorite and no one will know it’s both gluten-free and dairy-free! It truly only takes a handful of ingredients for this epic chocolatey treat! Making your own dairy-free puppy chow at home is very easy. With a few simple swaps, you can make a dairy-free treat that the whole family will love. It's great for a quick snack or for bringing to parties. Trust me, it will be a crowd favorite and no one will know it's both gluten-free and dairy-free! It truly only takes a handful of ingredients for this epic chocolatey treat! In a microwave safe bowl, add peanut butter, non-dairy butter, and dairy-free chocolate chips. Microwave in 30-second increments, mixing in between, until the chocolate is melted. It should take just about 1 minute total. Add the Rice Chex cereal to a large bowl. Pour the chocolate peanut butter mixture over the cereal. With a spatula, carefully mix until the cereal is completely covered with the chocolate. Add the chocolate covered cereal to a large tupperware with a lid or a gallon-sized Ziploc bag. Add 2 1/2 cups of the powdered sugar. Shake the container until the powdered sugar has covered the cereal. If the cereal is not completely covered or you can see chocolate showing through the powdered sugar, add the remaining 1/2 cup of powdered sugar. You can serve right away or store at room temperature. However, I prefer to store in the refrigerator and chill for at least an hour for cold puppy chow.